I have been waiting for the Chatsworth Fall Fair book to officially come out before I posted about it, but it’s out in the world now and I am very pleased to be a part of it. The fall fair is a big part of my in-laws’ lives. 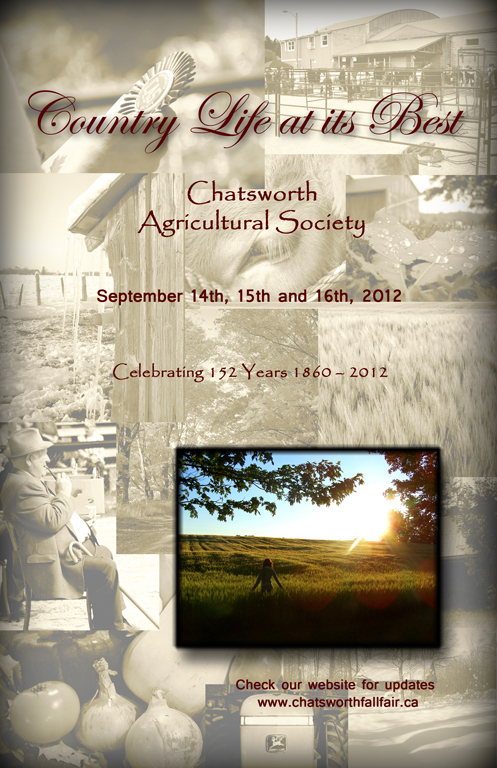 They are very active members of the Chatsworth Agricultural Society and put a tremendous amount of effort into helping organize and run the annual Fall Fair. Last year I acted as photographer for the Fair, and I am happy to contribute once again this year. A few months ago, my Mother-in-law contacted me about a photo for the Fall Fair book cover. I bounced some ideas around with the fair committee and ended up designing the cover of the book. This entry was posted in Architecture and Design, Out in Public, People, Random Goodness. Bookmark the permalink. Wow that’s cool, I didn’t know you were doing this! Thanks Nikki! Yes, I did some photography for the fair last year and was asked to help with the cover this year. Was fun! Looks good Mikey. You are becoming more and more of a country boy at heart. The cover looks great – really!